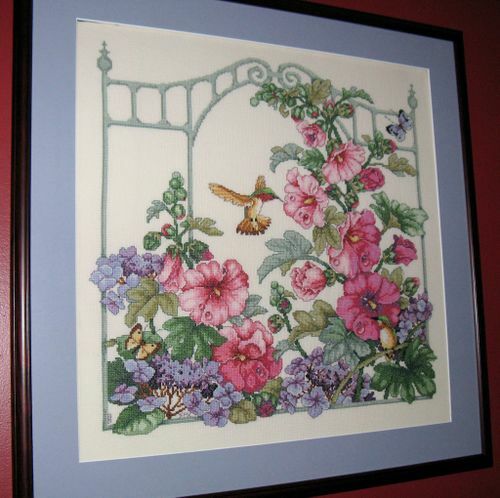 Leisure Arts kit by Barbara Baatz, stitched on Aida. I found a picture of this on the very first crafting blog I ever came across in 2002; I tracked down the kits on ebay and won an aggressive bidding war. This was truly a labor of love; I wanted all 3 panels to decorate our new house, which we bought in 2005. All in all, the trio is the biggest project I ever stitched. It was absolutely worth every moment. Matted and framed at Frame o' Mine in SE DC.